SecuritySolutionsWatch.com: Thank you for joining us again today Mark at this very exciting time in the growth of StrikeForce. The blockchain tsunami is undeniably now upon us. Please tell us more about your new subsidiary, BlockSafe, and the security solutions it will deliver to protect blockchain and cryptocurrencies. Mark Kay: That is a great question and of course, what BlockSafe is all about. BlockSafe is a NEW blockchain company with a BSAFE™ token. This seems to be the only security software company that provides security solutions for a blockchain company that prevents hacking a wallet one uses to process their blockchain transaction through the use of our Crypto Defender product that stops keyloggers from stealing your keystrokes and also from the camera, Clipboard and audio copy prevention and anti-ransomware and eventually self-healing. We also will provide our Blockchain Defender™ Agent that acts like a blockchain firewall that authenticates users, enforces corporate policies, acts as a load balance and protects from DDoS attacks. These products will be available in a short time for some features and within a year for some others. A very unique opportunity. SecuritySolutionsWatch.com: What are the latest developments regarding your core product line: ProtectID®, GuardedID®, and MobileTrust® ? Mark Kay: Thanks for asking, and this year really is the year for StrikeForce, even though I did say it last year. Unfortunately, the companies implementing our products in our channel did a lot more testing than planned, but fortunately they are about ready for large implementations to over millions of clients during this year. We are getting ready and we should have some real soon. We will let you know at least a few months after they go live and we can then PR them. Also our retail deals and company is about to sell through Canada through another Home Shopping website that could go internationally, as well as continuing selling through HSN and other stoes and websites in the US. SecuritySolutionsWatch.com: Thank you again for joining us today Mark. Any other subjects you would like to talk about? Mark Kay: Martin, I believe this is becoming a great year for us with the starting of our blockchain subsidiary, BlockSafe, and the continuation and finally implementation of our channel partners and our own enterprise clients. Stay tuned for more great reports and thanks for the opportunity to let everyone know about our great products, as we continue to grow them. StrikeForce Announces the Opening of its New Subsidiary, BlockSafe Technologies, Inc.
StrikeForce Technologies, Inc. (OTC PINK:SFOR) announced today a major software upgrade for GuardedID®, making it the best anti-keylogging software for your PC or MAC, with the most unprecedented security benefits. While cyber criminals know that keylogging malware is the de facto standard on how to steal login credentials and confidential information, they are constantly adding new attack vectors to trick and deceive. Clickjacking and hooking are examples of two new attack vectors that should not be underestimated. This new breed of spyware is also designed to avoid detection from all the popular anti-virus programs. GuardedID can now prevent this new breed of attack vectors from being successful. SecuritySolutionsWatch.com: Thank you for joining us again today Mark. We read with great interest in your recent Press Release that United States Patent and Trademark Office denied two petitions for inter partes review (â€œIPRâ€�), IPR2017-01041 and IPR2017-01064, filed by Centrify Corporation, Duo Security, Inc., and Trustwave Holdings, Inc. Care to elaborate on this major development? Mark Kay: Thanks for the great question. This Press Release is definitely a major release relating to our 7 (seven) patents lawsuits. Not only did the USPTO deny the IPRs, but the entire IPRs were denied leaving DUO Security, Inc., Centrify Corporation, and Trustwave Holdings, Inc. with none of our claims being dropped. This is a positive and low percentage of occurrence. This means the Stay for 1 year or so doesn't happen. Instead it will only be some months delayed. We are very happy with this inter partes review (â€œIPRâ€�) decision and the great job our lawyers have done. SecuritySolutionsWatch.com: What's the latest regarding your core business. Any updates you can share with us? Mark Kay: This is a most important question and there are updates, but nothing yet that I can report on in detail. We are working with major clients that our distributors are finalizing and some are starting to advertise. Currently we can't disclose, advertise or PR them, but overall we should be able to once we receive monies through these deals and they are done. We are hoping for something decent this year. If not, it will certainly be early next year but nothing we can do about the timing. There are also some medium size deals we are completing and in the retail space as we continue to sell on Home Shopping Network and through Staples, Office Depot, Best Buy, etc., for which we should be receiving payments shortly through our new distributor. SecuritySolutionsWatch.com: Can we talk about the bitcoin market for a moment? What is your perspective regarding this new currency and the unique capabilities of StrikeForce to participate in this explosive new space? Mark Kay: StrikeForce has been studying the bitcoin market and we see that our products, can definitely add great value to this new market (stopping Ransomware and Authentication) and we are looking into participating in some way in this new Blockchain Market. I can't discuss this further until we have a decision either way. SecuritySolutionsWatch.com: Thank you again for joining us today, Mark, are there any other subjects you would like to discuss? Mark Kay: First of all thank you very much for this opportunity to update our shareholders. We are also considering moving up from the Pink Sheets to the QB if our stock holds on for another month or so. This should help those interested in buying and selling our shares. We are also having an Annual Shareholder Meeting on Friday, November 17th, 2017 at our offices in Edison, NJ. All shareholders are welcome. SecuritySolutionsWatch.com: Congratulations on the traction you have achieved for StrikeForce solutions. Revenues are up and we read with great interest about several new customers and distribution channels which include: Amazon, Best Buy, Office Depot, Staples, HSN and Target, just to name a few. Very impressive, indeed! Please give us an overview of these key relationships? Mark Kay: That is a great question and we did start a Retail selling arm within StrikeForce where we manufacture boxes as necessary and sell GuardedID® and MobileTrust® through the stores and online. We go through a distributor who pays us about 90 days laterand manages the sites for us. Amazon is definitely a great seller for us amongst others and now that we are on HSN we will continue to have more showings there, which seem to be beneficial. This is definitely a good lead for us. It is also a great way to understand how our keystroke encryption patented products work (GuardedID) and (MobileTrust), for which it is the only solution that has its own keyboard on iPhone and Android mobile devices. We expect to spend more time and money in this area. SecuritySolutionsWatch.com: What’s the latest, please, regarding the launch on HSN? Mark Kay: Simply stated, we can’t really talk about HSN, other than it is going well and we will have two more showings in August. We see this as a great learning curve for the customers and definitely getting the name out there as a very strong and unique anti-malware solution for PCs, MACs, and Mobile Devices that work REAL-TIME! Mobile Devices have now become a major target for many hackers and malware; and we have the ONLY solution that stops stealing from Mobile Devices (iPhones and Androids) with keystroke encryption and ease of use. Sales are definitely growing. SecuritySolutions Watch.com: Any new products StrikeForce is offering? 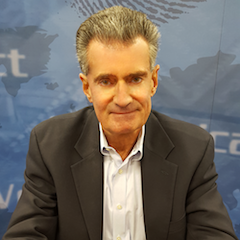 Mark Kay: StrikeForce has been doing research for a number of years and is coming out with our own PUSH capability on ProtectID® (fingerprint, Allow or Deny, OTP, etc. ), our authentication product that is also heavily patented as well. We now have it as a technical capability that three of our ProtectID clients are testing it. We should be announcing it in production within a few months. This is very key and part of our patents, which Google and RSA just announced their heavy use of PUSH Authentication as their main capability. SecuritySolutionsWatch.com: Any other key customers or relationships you’d like to mention? Mark Kay: As I have said in an interview around the first of the year, we have some major new clients now testing and about to go live and we should receive revenues from them during the second half of this year, probably closer to the end of year. They are mainly through our channel partners and we are very excited about these deals and have worked on them for some years. We will put out a PR when they start large sales that will lead to revenues worth reporting on. These sales should bypass the sales to date. SecuritySolutionsWatch.com: One will read on your Homepage that, “StrikeForce Technologies is a unique Cybersecurity Company for businesses & consumers that provides, “Out-of-Band Authentication” and “Endpoint Protection” using keystroke encryption, for signing on securely to your bank, broker, retail stores, etc.” How does it work, Mark? Mark Kay: It would take too long in an interview to explain how our products work in detail, but using our Out-Of-Band Authentication and Keystroke Encryption will definitely be unique in the industry, especially now with PUSH Authentication. This will definitely be the best way to sign on to a bank that provides a solution, which prevents Cybersecurity issues through authentication and encryption working together for you. SecuritySolutionsWatch.com: Security threats and cyber breaches are, unfortunately, in the headlines almost every day now. What is your perspective, Mark, regarding the key market drivers for StrikeForce products at this time. Mark Kay: The key market drivers are increasing every day and every year. The numbers are in the twenty of trillions now and as we move forward into the forty trillions, technology is used more and more with cars, loT items, reaching your finance companies, doing more with websites and basically everything you do and work with, especially with Amazon Echo that almost turns everything on electronically that you need. Therefore, cybersecurity protection is needed more today than ever before. Authentication is no longer a thought, but now a necessity, especially with keystroke encryption as an add on capability that protects you even further. SecuritySolutionsWatch.com: Let’s drill down a bit into ProtectID®, GuardedID® , MobileTrust®. What are the key features and benefits of each? Mark Kay: These three products are our basic products for which GuardedID and MobileTrust are often bundled into one license for ease of purchase. GuardedID is our keystroke encryption product that works on PC’s and MAC’s and MobileTrust, which is also keystroke encryption with its own keyboard, works on iPhones and Androids. Both provide keystroke encryption as well as other critical security capabilities. MobileTrust also works with our authentication platform, ProtectID, from a mobile device in terms of ProtectID’s One Time Password. The ProtectID® mobile product, our 4th product provided on Google Play and iPhone Store, works with our ProtectID Authentication Platform and is our Out-of-Band Authentication product that is sold to enterprises for their clients and employees. It also provides tokens, PUSH (TBD), phone, OTP, Email, and SMS and other authentications that provide Out-of-Band and In-Band solutions. SecuritySolutionsWatch.com: What is the unique value proposition that StrikeForce delivers to your customers in todays’ constant threat environment? Are free demos available? Mark Kay: The unique value proposition is that we prevent all CyberSecurity hits that come from your keystrokes on PC’s, MAC’s and iPhones, iPADS and Androids, or through authentication on your PC’s or MAC’s, or a combination, which today is over 90% of all malware and other hacks that effects your computers, phones, critical data, etc., unlike any other software. Yes, we offer free demos on ProtectID, which is on our website. If you want a demo for GuardedID and/or MobileTrust please call us at (732) 661-9641 from9AM-5PM EDT. We would be glad to help. SecuritySolutionsWatch.com: StrikeForce was recently awarded Patent No. 8,566,608 for Keystroke Encryption on PCs, Macs, and Mobile Devices. Please update us on the company’s patent portfolio and, to the extent you can, on the various litigation underway to guard against patent infringement. Mark Kay: We currently have 6 Patents, 3 for Out-of-Band Authentication and 3 Patents Pending (ProtectID), and 3 additional Patents for GuardedID and 1 International Patent Pending for MobileTrust. We are currently suing 7 companies against our Out-of-Band Patents, for which we completed and was awarded money from the one prior. All currently are active and in progress. I can’t give any updates on these throughout their processes. SecuritySolutionsWatch.com: Thank you again Mark for joining us today...are there any other subjects you would like to discuss? Mark Kay: I would just like to say this year should be our biggest year for revenues or definitely real close to achieving and this does not include our litigations. This is definitely a very busy year. Hopefully, it shows in our stock price.